A tour of the Cedi Bead Factory is a must for visitors to Ghana's Eastern Region. Here, glass beads are made from recycled glass bottles and sold to markets and craft shops through the country and overseas. The art of making glass beads has a long history in Ghana. For the past 400 years, the finished products have been used in ceremonies of birth, coming of age, marriage, and death. Today, the city of Odumase Krobo and the wider Krobo district are particularly associated with the making of traditional glass beads. At Cedi Bead Factory, you can watch the intricate production process from beginning to end. You can also stay overnight and learn how to design your own beads. Hidden down an unpaved road, the Cedi Bead Factory isn't the easiest place to find. Once you do, you're rewarded with the sight of a beautiful garden planted around the thatched building that serves as the factory itself. This is no noisy center of industry. The Cedi Bead Factory employs around 12 full-time staff and is surprisingly quiet. Tours are free and take approximately 30 minutes - making this the perfect stopover for those en route to Kumasi or the Volta River. A small gift shop has some very nice beads for sale, as well as bracelets, earrings, and necklaces. Top Tip: If you have any empty glass bottles, you can recycle them at the factory. Rarer colored glass (like red or blue) is particularly well received. Recycled glass bottles are crushed using a heavy pestle and mortar. After being reduced to a fine powder, the glass is poured into a mold made of clay. The inside of the mold is covered in a mixture of kaolin and water to stop the glass from sticking to the sides. The powder can be layered to create different colors and patterns, or kept plain. When ready, the mold is placed into a kiln and baked. Patterns and decorations can be added after the initial firing. In this case, crushed glass powder is mixed with a little water and then painted onto the bead, which is then fired a second time. Sometimes dye is added for extra bright colors, or when colored glass is unavailable. For more translucent beads, the glass is broken into small pieces, as opposed to being ground into a powder. The kiln is made from termite mound clay. It is heated using crushed palm kernels which burn at an extremely hot temperature and retain heat well. Ironsmiths use the same kernels in local villages throughout Ghana to make axes and hoes. The glass beads are usually fired for an hour. As soon as they come out of the kiln, a small metal tool is used to create a hole for the string to fit through. Some bead holes are made using a cassava stem that burns away during firing, leaving a round perforation. Once the beads are cooled, they are washed using sand and water. The beads are then strung and ready for sale at colorful markets throughout the country. For independent travelers, the best way to get to the Cedi Bead Factory is to take a tro-tro to the junction on the main road from Koforidua to Kpong, between the towns of Somanya and Odumase Krobo. From there, it's a good 20-minute walk down a rutted road, so grab a taxi if you can. Better yet, hire a private guide to take you there en route to Ho or Akisombo, or book a place on a guided tour. A few guest cottages have been built right on the premises, offering basic rooms and locally prepared meals. These are convenient if you want to spend a few days learning how to create your own glass bead masterpiece. You can buy beads directly from the Cedi Bead Factory shop. Alternatively, you'll find the factory's products at the best bead market in Ghana, held every day in Koforidua. Another good market close to the source is Agomanya Market, which operates on Wednesdays and Saturdays. This market is also located off the main road between Koforidua and Kpong. 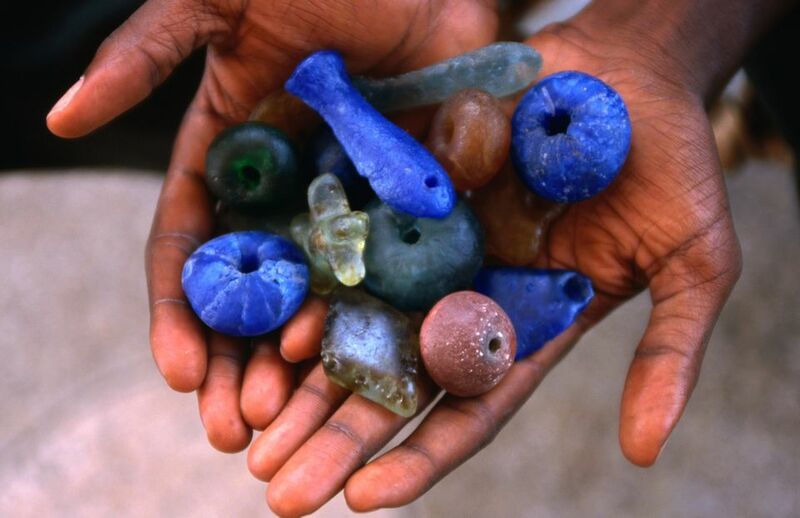 Additionally, a wide selection of recycled glass beads can be found in the main markets in Kumasi and Accra. This article was updated by Jessica Macdonald on March 21st 2017.